I always make a big ham for Easter dinner and am always scrambling to create different dishes to use it up before it spoils. One of my favorite go to meals is to make a meat into a panini, especially in the summer when I don’t want to heat up the house. While sandwiches are generally served for lunch a panini, or panino, is a dressed up sandwich that is perfect to serve for dinner. Everyone can put on as much or as little of the ingredients on as they like. I like to entertain with a panini party. So simple and fun. 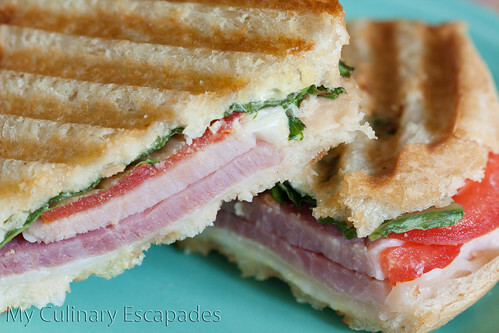 Everyone builds a sandwich and you cook it up on your panini grill. This is the panini maker I have and it has served me well for years. You are going to want to get everything ready before you start assembling and cooking your panini. Get your panini maker out and turn it on so it will be nice and hot when you are ready. Slice your bread into 1/2 inch thick slices and set aside. Cut your tomato into thin slices and set aside. Wash and trim your lettuce to accompany the size of your bread. Spread one side of your bread with mayo and the other side with dijon mustard. Place your cheese on first, things that are closest to the bread are going to melt the most because they are by the heat source. Cheese is definitely something you want to melt. Next add your ham, tomato, and lettuce. Once you have built your sandwich you need to lightly oil both sides of the outside bread with olive oil. I like to use a pastry brush that is made of boar bristles, but I know many do not like this and they do sell pastry brushes made from silicone. While you don’t ever run the risk of getting a hair in your food I don’t like the coverage they provide and I find them to be much more messy. Place sandwich on your hot panini grill and press lid down. Cook sandwich for 2-3 minutes or until it is well toasted and melted. Slice in half and enjoy.